The West Virginia Thunder fourth grade unit. Front row, left to right: Karson Jones (St. Albans (W. Va)), Kendall Taylor (Coal Grove), Sophi Hutchison (Chesapeake), Sienna Allen (Portsmouth), and Annie Ruth (Marietta). Back row, left to right: Coach Bruce Morris, Addyson Cornell (Fairland), Taegan Leep (Fairland), Bailey Russell (Fairland), Naomi Maynard (Ceredo (W. Va.) Vinson), Addison Godby (Fairland) and Coach Chris Staten. Members of the Dogwood Ridge Tokoshi Martial Arts Dojo. Front row, from left to right: Joshua Lawson, Jonathan Bailey, Staci Lansky, and Brady Warnock. Back row, from left to right: Megan Conley, Sydney Warnock, Chase Wagner, Victoria Thomas, and Alexander Thomas. Over the course of her time with the West Virginia Thunder, Portsmouth’s Sienna Allen has won a lot of basketball games over her very short lifespan. 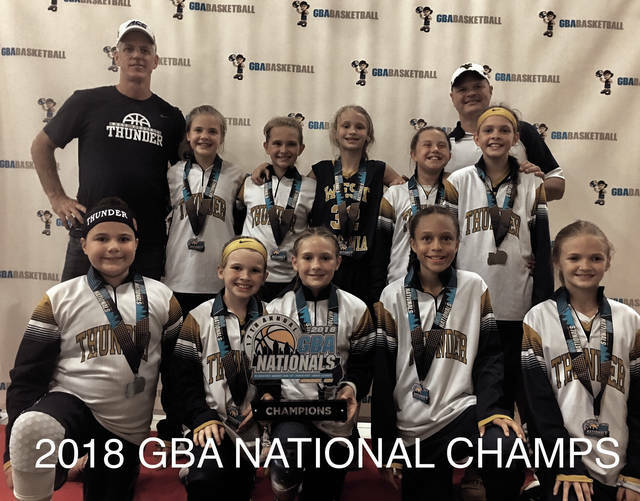 The fourth-grader continued that role with the Thunder last weekend, as West Virginia won the Fourth Grade Division Championship in the 17th Annual Girls Basketball Association Nationals that were held in Cincinnati, Ohio last weekend. Allen, who competes alongside a group of grils that hail from Chesapeake, Coal Grove, and Proctorville among additional towns across the Tri-State Area, played an integral role on a unit that posted ridiculous numbers en route to winning each of the six contests that it played in en route to taking home the championship crown. The Thunder, who won each of its six contests by double-digits, outscored their opponents by a 227-60 margin en route to put on a dominating display. West Virginia outscored the Kentucky Storm Elite, the Midwest Takeover, and the RGB Gold by a massive 116-12 tally in pool play alone, then defeated Thunder 3 45-15, Dayton Metro 35-23, and lastly, DHL Black by a 30-10 margin in the championship bout. The girls will be playing in the US Amateur Nationals in Tennessee and the AAU Nationals in Orlando over the upcoming month. 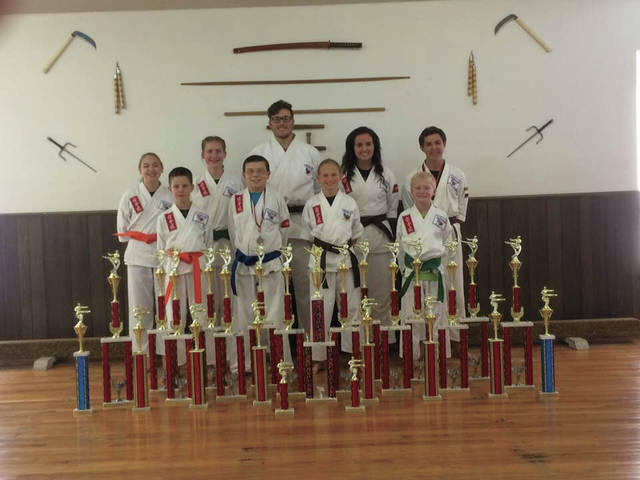 The Dogwood Ridge Tokoshi Martial Arts Dojo continued to put together a strong showing as nine students competed at the Smoky Mountain Classic, Karate for Christ World Championship Tournament. Joshua Lawson (first in Kata, second in weapons Kata, and first in fighting), Jonathan Bailey (first in Kata and fighting), Staci Lansky (second in Kata, weapons Kata and fighting), Brady Warnock (second in Kata, first in weapons Kata, and third in fighting), Megan Conley (second in Kata and first in weapons Kata and fighting), Sydney Warnock (first in Kata and fighting and second in weapons Kata), Chase Wagner (first in Kata, weapons Kata, and fighting), Victoria Thomas (first in Kata and weapons Kata and second in fighting), and Alexander Thomas (first in Kata and third in fighting) allowed the program to obtain top three finishes in every single event that Dogwood Ridge competed in. The dojo claimed 16 first-place finishes overall. https://www.portsmouth-dailytimes.com/wp-content/uploads/sites/28/2018/06/web1_IMG_9948_cmyk.jpgThe West Virginia Thunder fourth grade unit. Front row, left to right: Karson Jones (St. Albans (W. Va)), Kendall Taylor (Coal Grove), Sophi Hutchison (Chesapeake), Sienna Allen (Portsmouth), and Annie Ruth (Marietta). Back row, left to right: Coach Bruce Morris, Addyson Cornell (Fairland), Taegan Leep (Fairland), Bailey Russell (Fairland), Naomi Maynard (Ceredo (W. Va.) Vinson), Addison Godby (Fairland) and Coach Chris Staten. https://www.portsmouth-dailytimes.com/wp-content/uploads/sites/28/2018/06/web1_2018-Pigeon-Forge_cmyk.jpgMembers of the Dogwood Ridge Tokoshi Martial Arts Dojo. Front row, from left to right: Joshua Lawson, Jonathan Bailey, Staci Lansky, and Brady Warnock. Back row, from left to right: Megan Conley, Sydney Warnock, Chase Wagner, Victoria Thomas, and Alexander Thomas.